To protect the safety of the writer this post has been published anonymously. When Thai Army General Prayuth Chan-Ocha declared martial law on May 20, media workers felt it immediately. By law, they were no longer allowed to report anything negative about the military — not even a downtrend in the stock market. The military took total control on May 22, 2014, calling themselves the “National Council for Peace and Order”. After last week’s coup d’etat, television screens went dark and patriotic songs were broadcast repeatedly through all free channels to replace daily information. For a few days, only the army’s television channel was allowed to report the news — all positive things about the coup, of course. By order of the Council, both online and offline media have been forbidden from criticising the army or sharing content that could be “harmful to national harmony and public order”. ISPs were summoned to report to NCPO. Freedom of expression is Thailand is at stake. I can feel total censorship in the air. Simply criticising the Council could land one before a military court. When media cannot function, the lack of information creates a fertile breeding ground for rumours. Panic has spread rapidly online, with public servants quietly warning their friends and family who are active online that social media could be blocked any minute. There are also rumours that the Internet could be blacked out, although this has not happened yet. Why is freedom of expression so essential? During the 2010 military crackdown on the Red Shirt demonstrations, TV channels were not allowed to report on the situation. The army used real weapons to drive protesters away, resulting in 98 deaths. Without enough information, half of the nation supported the army in committing a massacre in the middle of Bangkok and reacted as if the protesters deserved to be killed. Freedom of expression is a safeguard to prevent human rights violations. When you know the media is watching, it is more difficult to do something wrong. 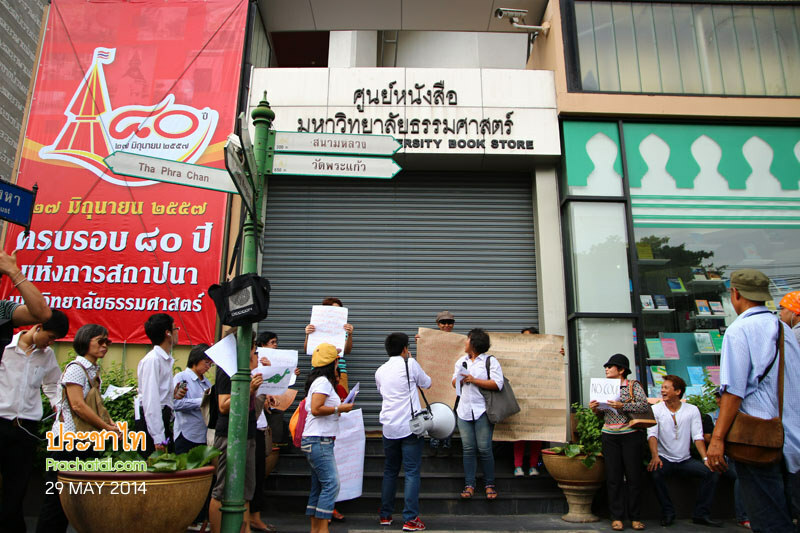 Regulations issued by Council may destroy the open nature of the Internet in Thailand. Panic and fear will lead to self-censorship. The Internet is not only regulated by the army and cyber police but somehow, by our own acquaintances. Trust between friends and family breaks down, sometimes even causing them to report on each other to authorities. This widespread fear leads to self-censorship. 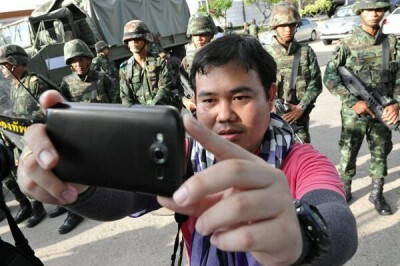 Thailand “coup selfie” posted on Twitter by @MarcoTexRanger. In this situation, the Internet is our last resort. Although the Council says these conditions are temporary, no one knows exactly how long ‘temporary’ will last or how much worse the situation could become. Media reports show citizens sharing selfies and flower photos online, but these do not reflect a nationwide reaction to the coup — rather, they are the only activities allowed. Silence does not mean consent. We don’t wish to keep silent, but who would want to risk being tried in a military court? Personally, I strongly disagree with the seizure of power through armed force and the limitation on freedom of expression, which can no longer be exercised domestically. With a dim hope, I wish to bring a free Internet back to Thailand. Global Voices takes the security of its contributors very seriously. We omitted the name of this author for their safety.